Previous post: Phoenixes in space! Next post: Time to scramble! After much deliberation, I’ve decided to name the TC-2 “Amazing Grace”, after Rear Admiral Grace Hopper. It’s appropriate on many levels. First, Grace Hopper was a singularly accomplished mathematician and computer scientist. She wrote the first working compiler, was tremendously influential in the development of COBOL (one of the most popular early programming languages), and developed the implementation of standards for testing computer systems and components for the U.S. Navy. 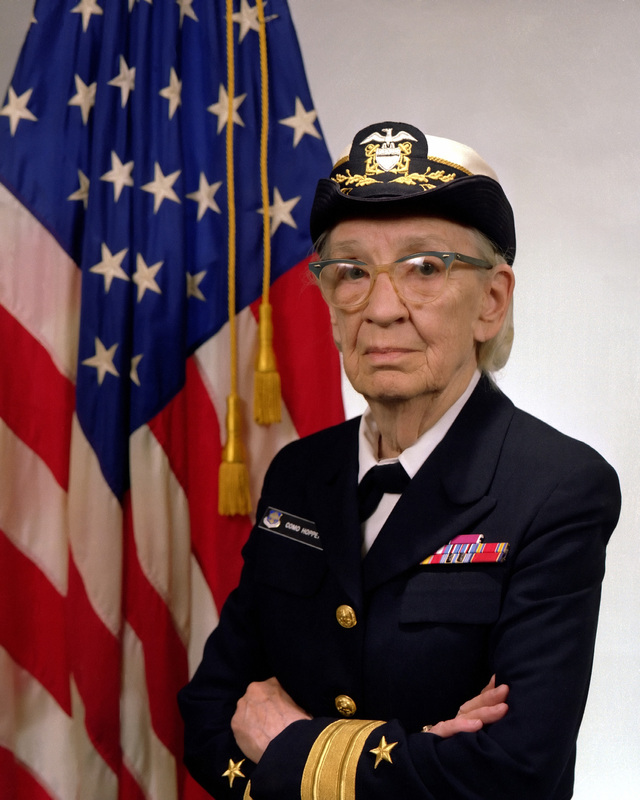 For her remarkable contributions to computer science, she was promoted to Commodore (a title later renamed “rear admiral, lower half”) by a special act of Congress/Presidential appointment. When she retired from the Navy at age 79, she received the Defense Distinguished Service Medal from the U.S. Navy, the highest non-combat award given by the U.S. military. In 1987, she received the very first Fellow Award from the Computer History Museum for her contributions to the development of programming languages and her efforts at standardizing computer languages. She is one of very few women to have a Navy warship named after her, the U.S.S. Hopper. (Read more about her on Wikipedia.) Due to her singular accomplishments, she was nicknamed “Amazing Grace”. Anyway, I like the name for several reasons. First, it follows my tradition of naming looms after prominent women in mathematics (and now computer science). My AVL Workshop Dobby Loom was named “Sophie,” after noted mathematicians Sofia Kovalevskaya and Sophie Germain. The 40-shaft AVL I currently have is named Emmy, after great mathematician Emmy Noether. Jacquard looms were in some sense the first computers, so naming the TC-2 after Grace Hopper seems eminently appropriate. And it’s a loom I never thought I’d be able to own, so it’s an “amazing grace” in that sense, too. Finally, I expect it to be a spectacular weaving tool, so “Amazing Grace” seems more appropriate than simply “Grace”. Amazing Grace is scheduled to arrive in port this Friday, August 28. If all goes well at Customs, she’ll be delivered to my door late the following week (circa September 4). And the loom assembly party is scheduled for Saturday, September 5. That will give me all weekend to get the first warp on! Wow! How lucky you were to get to see her in person! I wish I could have – she was (and is!) so inspirational. During the mid-to-late 1980s my employer (a Navy Lab) started hosting an annual Super Computer conference. They scheduled a bunch of technical presentations. Grace Hopper talked twice & both talks were different. She was an incredible inspiration. She used to send her people scurrying around buildings at night performing the proverbial “midnight requisitions” and told us forcefully that if it was a good idea then it was best to ask for forgiveness afterwards. There were not many women engineers/scientists in the 1980s and one could only imagine what it was like in the 1950s when she was working on the first compilers. She marched in energetically both years but she arrived a bit late the second year and the guy who was running the conference thanked her for coming in spite of some health problems. I applaud your name selection and am (as said before) excited about your future weaving.